The Rosetta team reports that last night’s orbit correction manoeuvre (OCM) – or thruster burn – was completed as planned, providing the first of three big orbital ‘pushes’ to get the spacecraft lined up for comet arrival in August. The burn ran for 7hrs:16mins, one of the longest burns in ESA spaceflight history, and began as scheduled at 15:23 UTC (17:23 CEST). 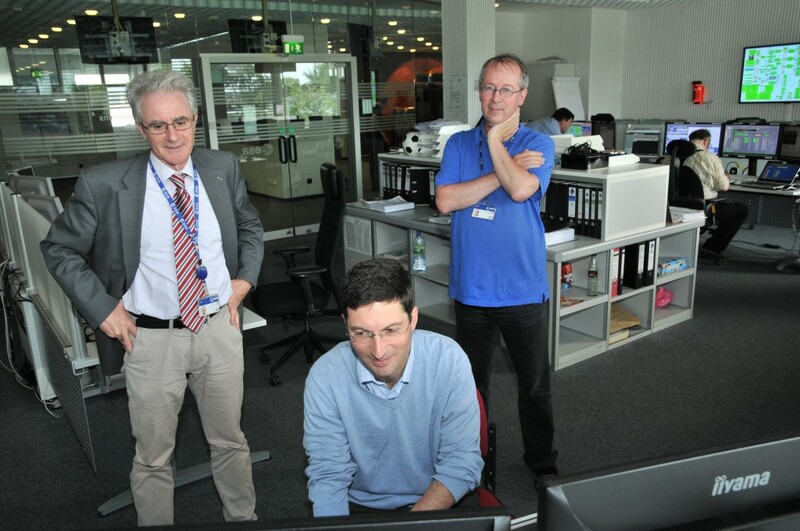 The mission control team had live radio contact with the craft via ESA’s New Norcia tracking station, and could follow progress in real time from a control room at ESOC. “Last night’s manoeuvre was absolutely necessary as part of a series of burns that will reduce Rosetta’s speed with respect to the comet so that we arrive at 67P on 6 August with a relative speed of about 1 m/s,” said Sylvain Lodiot, Rosetta Spacecraft Operations Manager. The mission team watched closely last night as the burn was progressing, 500 million km from Earth. The OCM was programmed to deliver a relative change in speed with respect to comet 67P of 291 metres/second (m/s). The burn used about 218 kg of fuel. Two more ‘big burns’ are planned, on 4 June and 18 June; these will be followed by a series of six smaller burns until arrival at the comet (see table in our earlier blog post, which covers up to the end of July; there are two final ‘pre-orbit insertion’ and ‘orbit insertion’ burns planned on 3 and 6 August – details later). Editor’s note: During the night, roughly around 02:30 CEST, Rosetta passed through the point of 1 000 000 km from the comet! Great job! Another step closer to making history! Fantastic job by the team. I’m looking forward to Rosetta landing on the comet…..it’s going to be mind blowing…..
Rosetta is the most fashinating mission ever! I’m with you! Go Rosetta! Great job, fantastic! This is so cool!! We are only limited by our imagination. Well done ESA, a superb example of triumph over hibernation. Shine on you crazy diamond! Being from the U.S., I’m used to following sophisticated space missions, but the level of complexity of the Rosetta mission leaves me in awe of the scientists and engineers at the ESA. Just getting this far is a magnificent feat with the length of time in space, the many gravitational boosts, and visiting both Lutetia and Steins on the way. Bravo! to the ESA and the Rosetta team. Your space friends in the U.S. wish you happy comet hunting! I agree it’s a great mission and everybody invloved deserves a great Bravo! But you should congratulate not only ESA but also the (many) other people involved! Same thing for the scientists/engineers who designed and built the instrument, they normally don’t work for ESA. Many thanks for keeping us informed ! I wonder if the combustion by-products of the thrusters could contaminate the comet, as they will arrive on it before the probe ! Perhaps not this time, the stream direction beeing slightly off-centered but the last burns before arrival, close to the target ? I was lead engineer on the prop subsystem before taking on the role of PFM test and finally fueling in French Guiana (both times!). Immensely proud of this wonderful spacecraft and all of the engineers who built, and are flying her. It’s been a long wait but we’re nearly there! There seems to be a complete dearth of follow on, more detailed information. As far as I can see nothing has been posted since the ‘it went ok’ news. Could we have more detail, what delta V was actually achieved, how is the helium pressurisation issue looking etc. We are almost at the next big burn, and know very little about the last one!